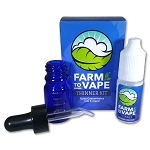 Farm to Vape e-liquids do not contain nicotine, cannabis or other substances regulated or prohibited by state or federal law. Purchasers are encouraged to consult the laws of their jurisdictions before combining our products with other substances. Farm to Vape products are intended only for legal uses, and we assume no responsibility or liability for our customers’ compliance or non-compliance with applicable statutes and regulations.